Archbishop Christodoulos, leader of Greece's Orthodox Church, made an emotional return to his homeland Friday after spending more than two months in a Florida hospital facility being treated for cancer. The archbishop arrived on a chartered jet and walked unaided through the throng of clerics, government officials and well-wishers before making a brief statement, his voice wavering. "I am very happy that I have returned to my Ithaka ... to continue the therapy which my doctors have recommended," Christodoulos said, referring to the hero's home in the ancient epic poem The Odyssey. "I am feeling very well." Christodoulos, 68, had spent 10 weeks in a University of Miami medical facility, where he was transferred in August in order to undergo a liver transplant. However, the Oct. 8 procedure was aborted when surgeons found that his cancer had spread to his abdominal cavity, and would metastasize faster with anti-organ rejection drugs. Christodoulos was first diagnosed with cancer in June while undergoing intestinal surgery, and spent 40 days in an Athens hospital. His treatment in Florida was overseen by Greek transplant surgeon Andreas Tzakis, who heads the facility's organ transplant institute. The archbishop's return coincides with two national commemorations, Friday's feast of St. Demetrius - patron saint of the northern city of Thessaloniki - and Sunday's Ohi Day, Greece's national holiday. The prelate has said he hoped to preside at a service in Athens cathedral on Sunday. 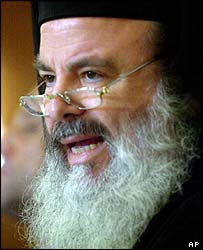 Christodoulos, who helped mend ties with the Roman Catholic Church by receiving Pope John Paul II in Athens in 2001 and visiting the Vatican last year, has frequently stirred controversy with his politically tinged statements and interventions in the public discourse since being elected head of the Orthodox Church of Greece in 1998. Nearly all of Greece's 11 million people have been baptized Orthodox. There are over 200 million Orthodox Christians worldwide, the second-largest Christian group in the world behind the Roman Catholic Church.